Catholicism for Everyone: Happy First Sunday of Advent!! This is very unique in that it is the earliest possible day for Advent in any given year in the Catholic Church and for Christianity in general. That's because it's on a Sunday and because of that the fourth Sunday of Advent is a Sunday and the following week is Christmas day. Normally if it was another day of the week, the Christmas Day would be just the following Sunday. Since the fourth Sunday of Advent and Christmas Day cannot be on the same day, it is therefore the longest possible time in between. 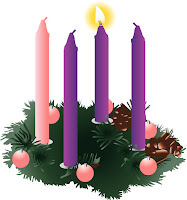 The latest day possible for the first Sunday of Advent is December 3rd. Incidentally that's when it is next year! So this year it is the earliest possible Advent and next year it's the latest possible advent.